My late father, who would have been sharing a birthday with President Obama today, used to preach a valuable lesson: Intelligent people don't waste time arguing over provable facts; it's easy enough to check who's right and who's wrong. Needless to say, he lived before the Internet reached its prime and before there was such a word as "birthers." The level of intelligent discourse in this country -- whether it be arguing about easily checked facts on like Obama's birthplace or something far more complicated like health care -- has reach abominable lows, with far too many people willing to scream instead of listening, egged on by a media that craves ratings more than truth. I'd rather not be writing about the birthers -- those who question Obama's citizenship and hence his right to be president -- because I don't want to give them any more publicity. But the movement (if that's the right word) is getting too dangerous to ignore. Almost 30% of Republicans now tell pollsters they don't believe Obama is a citizen. The percentage is larger in much of the South. A poll in Virginia, for example, found that 41% of Republicans believe he wasn't born in the U.S. and another 27% aren't sure. 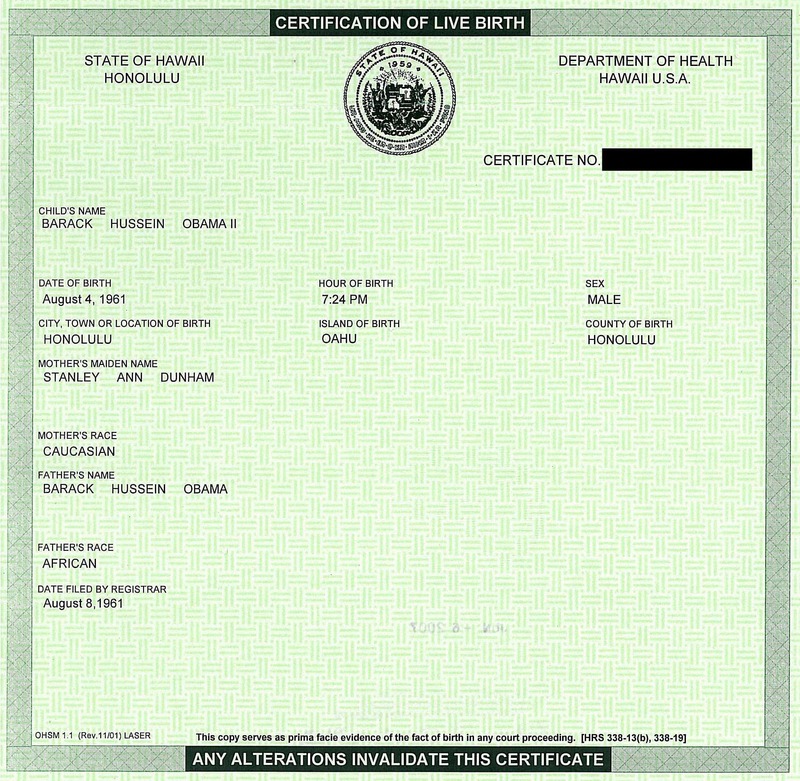 The birthers say Obama could clear up the controversy if he only released his birth certificate, but reporters were allowed to inspect and verify the certificate during the 2008 campaign. The Republican governor of Hawaii and the state's health director have attested to its authenticity and Obama's birth in Hawaii. And two Honolulu newspapers carried announcements of his birth in August 1961. If there is a conspiracy, it would have had to have started when he was born. The birthers, of course, reject the facts, but they were quick to seize and accept a phony birth certificate from the Republic of Kenya. Never mind that on the date it was supposedly issued, Kenya wasn't a republic yet. It was still a dominion and Mombasa, the alleged place of birth, was part of Zanzibar. None of these facts seems to matter with conservative talk show hosts and others who continue to keep this story alive in an effort to question Obama's legitimacy, which clearly has more than a little to do with the fact that he is black. That craziness is bad enough, but some of the nonsense going around about the health care bill is equally bad. Obama has to share the blame because he hasn't clearly defined what he wants in a bill. That lets everyone else characterize his goals for him. The typical approach is to seize on a grain of truth and turn it into something it was never intended to be, such as a public option becoming a stalking horse for a single-payer Canadian style system. The latest trend is the myth that Obama wants to shuffle old people off to early death to save money. The grain of truth, in this case, is a provision in the House version of the health bill that would pay doctors for their time if their patients want counseling on end-of-life issues. It, of course, would be voluntary and allow patients to at least know they don't have to have their lives extended by artificial means, regardless of their personal wishes. Talk show hosts are scaring as many people as they can about this, and Obama was famously asked at a recent town meeting if government workers would be knocking on seniors' doors to find out when they want to die. The trumpet has now been taken up by many Republicans who command mainstream media attention, including Pat Buchanan, who sought to extend the myth in a newspaper column today. Town hall meetings, meanwhile, are being reduced to shouting matches as organized protestors with prearranged agendas try to block informed and thoughtful debate. The health care issue is extremely complicated and worthy of careful public discussion. But it's clear that the decision will be made ultimately on the basis of 30-second commercials. Whoever can stir up the most fear, justified or not, will likely win. The birthers and those who want to prevent an honest health care debate may not have much in common. My fear is they do. And my concern is that intelligent political discourse is becoming all but impossible in the current environment.